Slow Agriculture is a term used to conceptualize the agricultural vision of Slow Food and Citta Slow movements (1, 2, 3). The basics of Slow Agriculture encompass all phases of local food growing, starting from biodiversity friendly landscape maintenance, extending into traditional food processing methods. In many cases, Slow Agriculture relies on local seeds and varieties as well as intergenerational transmission of indigenous knowledge on using land and growing food (3, 4). Socio-ecological production landscapes and seascapes (SEPLS), such as the Satoyama of Japan, could be regarded as the spatial basis of Slow Agriculture. The principles, methods and products of SEPLS are closely linked with the values of Slow Food and Citta Slow movements, albeit they are not practically interconnected (4, 5, 6). Satoyama refers to a Japanese term associated with traditional anthropogenic landscapes, embracing human production activities, such as agriculture, as well as unique and rich biodiversity (6). Although they are disappearing fast, landscapes similar to Satoyama are widely spread throughout all ecoregions of the globe. 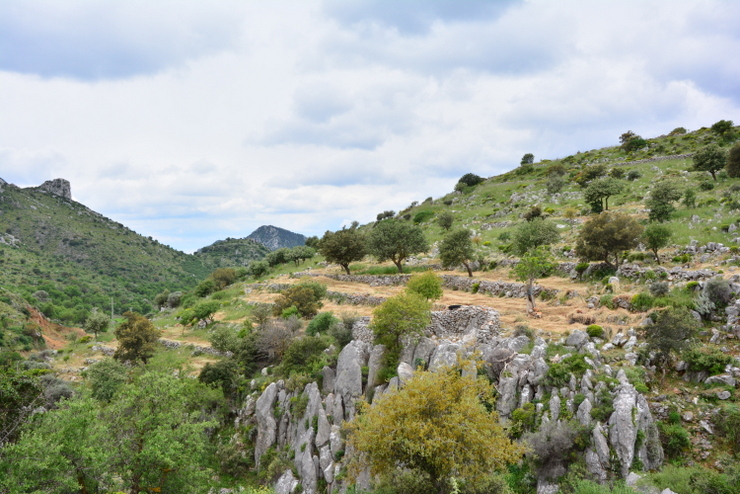 To name a few, dehasa corresponds to traditional landscapes in Spain, ahupua’a is in Hawaii and horata hills are spread along the southwest coastal rim of Anatolia, Turkey. Other distinctive forms of land management include the mauelsoop in Korea, muyong in the Philippines, and kebun in Indonesia and Malaysia (6, 7). High nature value farmlands in Europe represent similar landscapes, where human activities are sustained in harmony with the wider environment and biodiversity (8). Permaculture approach functions with similar values, also applicable to fine scale cultivation areas (9). Slow Agriculture could be regarded as the underpinningculture of landuse throughout these exceptionally diverse landscapes and approaches. Neolithic revolution dates back to 11.000 BC when first forms of agriculture originated in the Fertile Crescent, Anatolia (10). Over generations, indigenous communities have made countless innovations to cultivate their surrounding environment for their livelihoods. This new interaction with the earth did not only supply food and other fundamentals of pastoral living, but also nurtured traditions and culture along with sustaining the wider ecosystem shared with other species. However, as a result of the fast socio-economic development over the last century, traditional landscapes where Slow Agriculture by nature took place have shifted to uniform monocultures at an accelerating rate. Many traditional landscapes have turned into efficient and large-scale production areas causing environmental degradation and loss of nature cultures (6, 7). Over the last decades, a number of global movements and initiatives were launched to reverse this trend. In fact, Slow Agriculture lies at the intersection of Slow Food and Citta Slow movements, linking the food culture and the lifestyle of people with the wider landscape (4, 5). The Satoyama Initiative is based on the principle that traditional landscapescan maintain both biodiversity and human livelihoods leading to a society in harmony with nature, rather than developing against nature. The Satoyama Initiative defined the term “socio-ecological production landscapes and seascapes (SEPLS)” referring to all traditional landscapes where Slow Agriculture by nature takes place (11). Along with these international movements, several non-governmental and governmental organizations in Europe and elsewhere work on high nature value farm- and grasslands convening the main principles of Slow Agriculture (8). Although socio-ecological production landscapes widely vary according to local ecological and cultural conditions, all of them simultaneously support biodiversity, adaptation to climate change and soil protection (7, 11). There are not firmly laid standards for Slow Agriculture. All products shall principally meet the international organic food standards by definition, yet Slow Agriculture goes beyond that. First attempts to define the principles of Slow Agriculture propose four broad categories of criteria (3). The first category involves the use of landscape and the techniques used to cultivate the land. Indigenous landscapes, e.g. SEPLS, where the natural ecosystem is not heavily transformed are examples of such production areas (12). External agricultural entries such as fertilizers, other chemicals, irrigation water from large dams or heavy machinery are entirely excluded under this category (1, 2, 4, 14). The second category is linked with biodiversity and it proposes rich biodiversity as an essential element of the production scheme. The species benefiting from the production in the landscape shall be representative of the natural biotope extending in the area before human influence and they shall maintain viable populations in the production area (6, 7, 8, 14, 15). Third category focuses on harvesting and processing methods. The products can not be an output of a process harmful to health of producers, consumers and the wider biodiversity. Many times, Slow Agriculture products are processed by hand using traditional methods (4, 13). The last category covers the human aspect of production. Intergenerational transmission of knowledge is a key element of this category, while welfare and life quality of producers form another key segment (6, 7, 12, 13). Obviously, these principles are inadequately discussed until now and they all require further elaboration and refinement among key stakeholders. Seferihisar Nature School in Turkey has team established to refine the principles and criteria of Slow Agriculture (3). While Slow Agriculture per se is not widely recognized, there are several projects around this idea, on basis of individual products. Slow Wine of Slow Food in Italy and Slow Olive Oil production attempts in Turkey are examples of such projects (14, 15). The Satoyama Initiative approaches the issue from the other far angle, the landscape approach, although most of the products of SEPLS are subject to Slow Agriculture labeling by their nature (11). Similarly, permaculture and the European concept of high nature value farmlands offers great variety production schemes potentially considered as Slow Agriculture (8). (4) Slow Food International – Good, Clean and Fair Food (2011) Web. http://www.slowfood.com. (5) Parkins W, Craig G (2006). Slow Living. Berg. p. 79. ISBN 978-1-84520-160-9. (6) Kobori H, Primack RB (June 2003). Participatory Conservation Approaches for Satoyama: The Traditional Forest and Agricultural Landscape of Japan. AMBIO: A Journal of the Human Environment. Sweden: Royal Swedish Academy of Sciences: 307–11. (8) European Environment Agency (2004) High nature value farmland. Characteristics, trends and policy challenges. EEA Report 1. 32 pp. Luxembourg. (9) Mars R (2005). The Basics of Permaculture Design. Chelsea Green Publishing. (10) Diamond J, Bellwood P (2003) Farmers and Their Languages: The First Expansions. Science 300 (5619): 597–603.